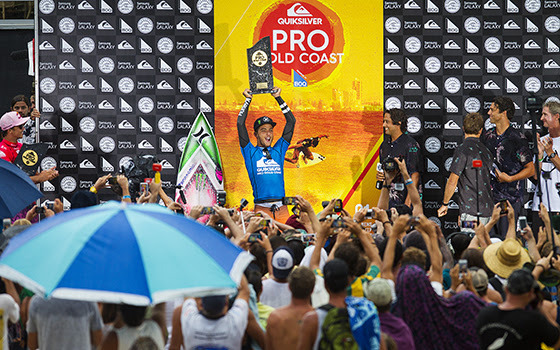 Caption: Young Brazilian Filipe Toledo celebrates winning the Quiksilver Pro Gold Coast. Call: Event complete - Congratulations Filipe and Carissa! COOLANGATTA, Queensland/Australia (Friday, March 13, 2015) - A thrilling Finals Day at the Quiksilver and Roxy Pro Gold Coast saw Filipe Toledo (BRA) and Carissa Moore (HAW) claim victory at Snapper Rocks in front of a huge, cheering crowd. Toledo defeated Julian Wilson (AUS) to win the Quiksilver Pro and Moore took down Stephanie Gilmore (AUS) to take the Roxy Pro title. Both Filipe and Moore will claim the yellow jersey after the opening event on the 2015 Samsung Galaxy World Surf League (WSL) Championship Tour (CT). Filipe Toledo (BRA), the in-form surfer of the event, claimed his first CT win today at the Quiksilver Pro. The youngest surfer on the men's Tour put on an unbelievable performance throughout the competition and delivered the highest heat total of the event in the Final today, a near-perfect 19.60. Entering his third year on the CT, Toledo consistently delivered mind-blowing turns and blistering aerial maneuvers to become the second Brazilian to win the event. On his way to the Final today Toledo previously dispatched Adriano de Souza (BRA) and Bede Durbidge (AUS). Toledo faced Julian Wilson (AUS) in the Final and the new-school match-up between two of the most progressive surfers on Tour did not disappoint. Toledo exploded out of the gates, earning an 8 and a 9 before his opponent had even taken a wave while Wilson waited nearly half the heat before posting his first score. An incredible heat played out, with both surfers locking in nine-point rides. A dynamic Toledo put everything into his turns and his air game was second-to-none, landing maneuver after maneuver. The young Brazilian put on another amazing display for a second 9-point ride and went to take a final wave under Wilson’s priority with one minute remaining to cement his win and bring the cheering crowd to their feet. His fast, radical surfing, earned him a Perfect 10 to seal the deal on his first CT Final and his first CT win. Caption: Carissa Moore (HAW) put on a clinic at Snapper Rocks to claim victory over Stephanie Gilmore (AUS) at the Roxy Pro. The Roxy Pro Final saw Carissa Moore (HAW) battle Stephanie Gilmore (AUS) in an epic clash. Moore looked composed and stylish, claiming a win at the first event of the season, taking the yellow jersey from her opponent and defeating the reigning six-time WSL Champion on her home turf. Moore didn’t drop a heat in the competition, winning through each Round on her way to the Final. Today was the 20th CT match-up for the pair and Moore’s win evens the score with 10 victories apiece. The win today is Moore’s 14th on the CT and her second victory on the Gold Coast, having previously won the event in 2011 on the way to her first World Title. Gilmore got to work early in the Final, maintaining her down-the-line flow for a solid opening score, an 8.33, but it was Moore’s day. The Hawaiian answered back with an unbelievable display, looking perfectly in sync with the wave to take an excellent 9.40. Moore was patient, holding priority and waiting until there were just seven minutes remaining to take her next ride. Moore put together a well-constructed wave earning another nine-point ride for a variety of powerful maneuvers, including a smooth roundhouse cutback, to leave Gilmore in a combination situation that she couldn’t escape. Moore put on a display of crowd-pleasing moves at the end of the heat in celebration of her victory, boasting an 18.43 heat total, the highest of the Roxy Pro. The highest ranked surfer going into today’s Quiksilver Pro Semifinals, Adriano de Souza (BRA), wasn’t able to contain the energy of his younger opponent. Toledo found the wave of the heat for an excellent 9.40, securing his place in the Final. De Souza looked frustrated and deflated as he struggled to escape the combination situation and takes home a 3rd-place finish, equaling his best result at Snapper Rocks. De Souza previously defeated three-time World Champion Mick Fanning (AUS) in their hotly anticipated Quarterfinal match-up. Fanning rode only three waves to the Brazilian’s 7 and couldn’t find the opportunity to match De Souza’s excellent 8.57. The two-time Quiksilver Pro winner equals his 5th-place finish at the event last year and will now set his sights on defending his Bells Beach title. A big clash between two long-time rivals Moore and Tyler Wright (AUS) saw the young Australian leave the event in third place. The pair have previously matched up 10 times in CT history, with Moore taking eight wins to Wright’s two. The two-time World Champion continued her winning streak today, beating the 2014 CT runner-up by 16.86 to 16.06 despite a strong showing from Wright, who previously defeated Courtney Conlogue (USA) in the Quarterfinals. Caption: Brazilian Rookie Wiggolly Dantas had an impressive day at the Quiksilver Pro, defeating Joel Parkinson (AUS) in Round 3 and earning a place in the Quarterfinals. COOLANGATTA, Queensland/Australia (Thursday, March 12, 2015) - Competition continued today at the Quiksilver Pro Gold Coast presented by BOQ with an action packed day at Snapper Rocks. The Quarterfinalists are set after the opening stop on this year’s Championship Tour (CT) ran through Rounds 3, 4 and 5. The day saw its share of upsets with Gabriel Medina (BRA), Kelly Slater (USA), John John Florence (HAW) and Joel Parkinson (AUS) all being eliminated from competition in Round 3 at the hands of their lower-seeded opponents. Three-time World Champion Mick Fanning (AUS) looked strong throughout the day, first facing Dusty Payne (HAW) in Round 3 where he used his trademark carves to claim a nine-point ride and the top spot. Next he went on to win through Round 4 in a stacked heat against Adriano de Souza (BRA) and Bede Durbidge (AUS) for a place in the Quarterfinals. Beautiful rail work from De Souza almost sent the Australian to Round 5 after the pair tied the heat with 16.50 each, but victory went to Fanning for the highest single-wave score. Fanning will face De Souza again in the Quarterfinals, after the Brazilian moved on to dispatch Matt Wilkinson (AUS) in a close Round 5 match-up with a passionate and energetic performance. Wilkinson previously delivered one of the day’s upsets in Round 3, and looked in blistering form as he defeated John John Florence (HAW), eliminating him from the competition. Filipe Toledo (BRA) was another of the day’s standout performers. He started strong in his highly anticipated Round 3 bout against Kolohe Andino (USA), opening his account with a near-perfect 9.57 and holding the American off with an 8.93 and the day’s highest heat total, 18.50. The progressive Brazilian continued to shine in Round 4 where another nine-point ride helped him dispatch Jordy Smith (ZAF) and Wilkinson to move through to the Quarterfinals where he will face Durbidge. "I love to surf rights and I've been really confident and comfortable," Toledo said. "The long wait was good for my mind and to figure out my boards. I’ll just keep going and having fun, doing what I loved to do, I’m super stoked. I think this year is going to be a great year for Brazil and for the younger guys on tour." Reigning WSL Champion Gabriel Medina (BRA) is out of the competition after being defeated by Glenn Hall (IRL) in Round 3. Hall put the pressure on from the start, holding the lead with five minutes remaining to leave the champion searching for a 6.73 to turn the heat. Medina went for a wave under Hall’s priority causing an interference and losing his second score, ending his chances of making it through to the next round. Medina leaves in equal 13th place. Brazilian rookies Italo Ferreira (BRA) and Wiggolly Dantas (BRA) also dealt out big upsets in Round 3 today. Ferreira eliminated 11-time World Champion Kelly Slater (USA) while Dantas took down Joel Parkinson (AUS). Ferreira built on his momentum from Round 2, where he defeated CT veteran Adrian Buchan (AUS), and held the edge over Slater through their heat, completing an explosive rotation for a 7.17. Despite a board change, Slater couldn’t find the waves or the excellent score required to avoid defeat and leaves the first event of the season in 13th place. Ferreira made it through to Round 5 where he was eventually defeated by two-time Quiksilver Pro Gold Coast winner Taj Burrow (AUS), who takes his place in the Quarterfinals where he will face Julian Wilson (AUS). Dantas held the lead over Parkinson with a 7.67 and a 5.50 for his aggressive backhand attack, while the 2012 World Champion was left with just a 3.83 on the board. The local favorite looked out of rhythm while Dantas maintained his composure through the heat against his more experienced opponent, securing his win with an 8.10. This is Parkinson’s worst ever result the Quiksilver Pro, taking home an equal 13th place finish. Dantas went on to claim his place in the Quarterfinals after defeating Hall in Round 5 thanks to a 9.17 for a series of powerful maneuvers to leave his opponent in a combination situation. He will face compatriot Miguel Pupo (BRA) in the Quarterfinals tomorrow. The Quiksilver Pro Gold Coast runs in conjunction with the Roxy Pro. 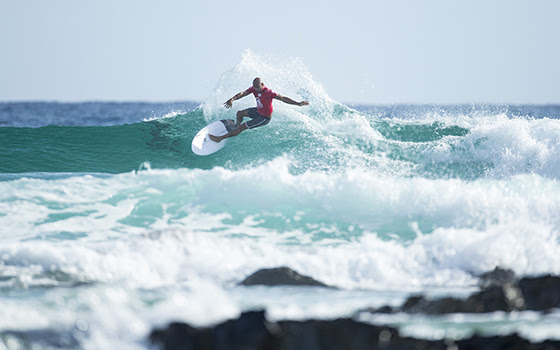 Caption: Kelly Slater (USA) will take on Italo Ferreira (BRA) in the opening heat of Round 3. COOLANGATTA, Queensland/Australia (Thursday, March 12, 2015) - The Quiksilver Pro Gold Coast presented by BOQ, the opening stop on the Samsung Galaxy World Surf League (WSL) Championship Tour, has been called ON today. Competition will begin with Round 3 at 7:05 a.m. local time at Snapper Rocks, with Rounds 4 and 5 on standby. The Roxy Pro Gold Coast has been called off for the day. "There's a lot more power in the water today," said WSL Commissioner, Kieren Perrow. "It's great to see that the swell has filled in and it's more organized, bigger and cleaner, so we are are on. We've got a big today today and will be finishing tomorrow. Today we'll just run the Quiksilver Pro, we'll start with Round 3 and then go into Rounds 4 and 5." First up will be 11-time World Champion Kelly Slater (USA) taking on Brazilian rookieItalo Ferreira (BRA), who caused an upset in Round 2 yesterday by eliminating Adrian Buchan (AUS). Reigning WSL Champion Gabriel Medina (BRA) faces Glenn Hall (IRL) in Round 3 Heat 6, followed by Mick Fanning (AUS) and Dusty Payne (HAW) in Heat 7. We’ll see a further build in E tradeswell on Thursday and into Friday in both size and power, although we are not expecting a major swell. Stronger SE flow will also develop, especially in the afternoons, for the second half of the week. Tropical Cyclone Pam is currently located just east of Vanuatu and is on a slow south-southwest track. Although Pam does not look to directly provide surf before the contest waiting period closes, it will help to enhance the tradeswell a bit over the next couple days. The Quiksilver and Roxy Pro Gold Coast will be webcast LIVE at WorldSurfLeague.com. The world's best surfing will also be broadcast LIVE on Fox Sports in Australia, MCS Extreme in France, EDGE Sports in China, South Korea Malaysia and other territories and the WSL's new partner in Brazil, Globo TV. 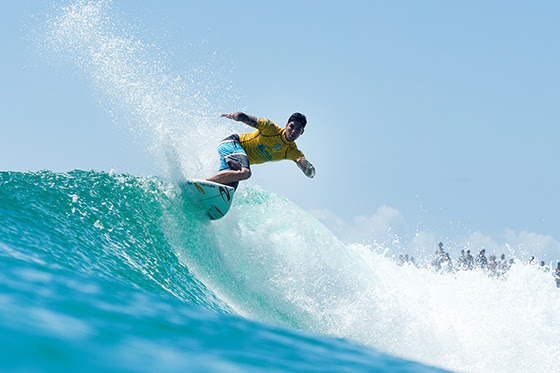 The Quiksilver Pro runs in conjunction with the Roxy Pro Gold Coast. Caption: Filipe Toledo (BRA) delivered one of the performances of the day, looking dominant in his Round 2 heat against Adrian Buchan (AUS). COOLANGATTA, Queensland/Australia (Wednesday, March 11, 2015) - Competition at the Quiksilver Pro Gold Coast presented by BOQ recommenced today after 11 consecutive lay days and ran through Round 2 at Snapper Rocks. The world’s best surfers battled through tough conditions to avoid elimination and earn a place in Round 3. Caption: Mick Fanning (AUS), pictured during a Carlton Dry Expression Session, will face Dane Reynolds (USA) in Round 2 of the Quiksilver Pro. COOLANGATTA, Queensland/Australia (Wednesday, March 11, 2015) - The Quiksilver Pro Gold Coast presented by BOQ, the opening stop on the Samsung Galaxy World Surf League (WSL) Championship Tour, has been called ON today. Competition will begin with Round 2 at 7:35 a.m. local time at Snapper Rocks, with the Roxy Pro Quarterfinals on hold. "It's on," said WSL Commissioner, Kieren Perrow. "We'll be running Round 2 of the Quiksilver Pro and we're excited to get underway. Conditions are a little undersized from what we expected this morning but it's supposed to build through the day." First to take to the water will be three-time World Champion Mick Fanning (AUS) facing wildcard Dane Reynolds (USA) in the opening heat followed by 11-time World Champion Kelly Slater (USA) taking on trials winner Jack Freestone (AUS) in Heat 2. The Roxy Pro Quarterfinalists are set and reigning six-time WSL Champion Stephanie Gilmore (AUS) will take on Silvana Lima (BRA) for the third time this competition. A gradual increase in E trade swell is forecast for the mid to second part of the week, with confidence increasing that we’ll see fun to moderate size waves, especially by Friday. Tropical Storm Pam has developed to the northwest of Fiji, although it does not look to directly provide surf before the contest waiting period closes (but will help to enhance tradeswell a bit). Caption: Silvana Lima (BRA) flies through to the Quarterfinals after an outstanding performance in Round 4 today at the Roxy Pro. COOLANGATTA, Queensland/Australia (Friday, March 6, 2015) - Quarterfinalists were decided today at the Roxy Pro Gold Coast presented by BOQ, the opening stop on the Samsung Galaxy World Surf League (WSL) Championship Tour. The world’s best battled through Rounds 3 and 4 in small, clean surf at Snapper Rocks and the field was narrowed down to just eight surfers. Silvana Lima (BRA) delivered the most dominant performance of the Roxy Pro to date, posting the first Perfect 10 of season in her heat against Sally Fitzgibbons (AUS). Despite a blistering start from the Australian with a near-perfect 9.63, the Brazilian unleashed her full repertoire on the Snapper Walls, using her air game and power turns to take her place in the Quarterfinals. Lima will face Stephanie Gilmore (AUS) in the Quarterfinals for the third time this competition. The pair previously matched up in Round 1, where Lima took the win, and again in Round 3 where the Brazilian charger put the pressure on the reigning six-time WSL Champion. Lima held the lead through much of the heat, while Gilmore faltered on some more radical maneuvers. Gilmore took a wave in the final seconds, using her classic rail game to earn an excellent 9.00, a last-minute win and a place in the Quarterfinals. Tyler Wright (AUS) was another top performer and faced Courtney Conlogue (USA) and Coco Ho (HAW) in a stacked Round 3 heat. Wright looked impressive from the start, posting an excellent 8.77 early on. Despite a strong showing from her opponents Wright held the lead and takes her place in the Quarterfinals thanks to a 17.20 heat total. Conlogue went on to defeat Nikki Van Dijk (AUS) in Round 4 and will face Wright again in the Quarterfinals. Hawaiian surfers Carissa Moore (HAW), Malia Manuel (HAW) and Tatiana Weston-Webb (HAW) were in fine form today, each earning a Quarterfinal berth. In Round 3 Moore defeated Lakey Peterson (USA) and Nikki Van Dijk (AUS) while Manuel took a dynamic victory in her heat against Weston-Webb and Fitzgibbons. Weston-Webb went on to edge a last-minute win over Dimity Stoyle (AUS) in their exciting Round 4 battle. Peterson went on to defeat Coco Ho (HAW) in Round 4 and will face Moore in the Quarterfinals. The Roxy Pro Gold Coast is webcast LIVE at WorldSurfLeague.com. The Roxy Pro Gold Coasts runs in conjunction with the Quiksilver Pro Gold Coast. Caption: Action in the water with the world's best surfers like Kolohe Andino will be matched with action on the land this Friday with a FREE Chevy Metal show presented by the World Surf League (WSL). COOLANGATTA, Queensland/Australia (Wednesday, March 4, 2015) - Chevy Metal, the cover band formed more than a decade ago by Taylor Hawkins (Foo Fighters/The Birds of Satan), will play a free show at the opening stop of the 2015 World Surf League (WSL) Championship Tour, the Quiksilver and Roxy Pro Gold Coast, this Friday, March 6th at 4:30pm at Snapper Rocks. Featuring Hawkins along with Wiley Hodgden (Bass/Vocals), Chris Shiflett (Guitar) and Rami Jaffee (Keys), Chevy Metal will rip into some deep cuts off albums by Rolling Stones, Queen, The Police, Black Sabbath, Van Halen and more. Hawkins, Hodgden, Shiflett and Jaffee are looking forward to some Gold Coast surf action, playing some rock and helping to raise awareness for the Mauli Ola Foundation. The Mauli Ola Foundation is a nonprofit organization dedicated to providing hope and confidence to individuals living with genetic diseases. Harnessing the healing powers of the ocean, the Mauli Ola Foundation introduces surfing and other ocean based activities as natural therapies. The world’s best surfers took a break from competition on Monday afternoon to spend time in the water with kids from the Mauli Ola Foundation. Caption: Coco Ho (HAW) netted both the day's highest single-wave score and heat total at the Roxy Pro. COOLANGATTA, Queensland/Australia (Tuesday, March 3, 2015) - Action at the Roxy Pro Gold Coast presented by BOQ continued today with Round 2 after two-consecutive lay days. The first elimination round of this year’s Samsung Galaxy World Surf League (WSL) Championship Tour saw fiery exchanges as the world’s best female surfers fought hard to avoid an early exit. Hawaiian surfers Coco Ho (HAW) and Tatiana Weston-Webb (HAW) were the standout performers of the day, each dominating their Round 2 heats and making the most of what Snapper Rocks had to offer. Coco Ho (HAW) and Laura Enever (AUS) both looked in great form as they battled in their Round 2 matchup. Ho exploded out of the pocket, lighting up the Snapper walls and was rewarded with an excellent 9.23 and the heat win. Despite a strong showing Evener was left in need of a near-perfect score to better Ho’s 16.16 two-wave heat total, today’s top score, and is eliminated from the competition. A backhand battle between Tatiana Weston-Webb (HAW) and Bianca Buitendag (ZAF) unfolded in Heat 5. Weston-Webb held the lead throughout the heat, looking confident as she claimed her third Championship Tour win over the South African and a place in Round 3. Last year’s Roxy Pro runner-up, Buitendag, will have to set her sites on Bells Beach as she leaves the competition in equal 13th place. Another of the day’s top performers was Nikki Van Dijk (AUS) who took on 2014 Rookie of the Year, Johanne Defay (FRA), in Round 2 Heat 2. The power of Defay against the smooth transitions of Van Dijk saw the surfers neck and neck through the majority of the 30-minute heat. Both posted scores in the excellent range (8 points and above), with Defay claiming a 9.00 while Van Dijk was rewarded with an 8.10. In the end it was the in-form Australian who took the win courtesy of a 7.37 backup score. An unusual Round 2 appearance for Stephanie Gilmore (AUS) saw her face Bronte Macaulay (AUS). The trials winner pushed Gilmore throughout their heat, holding the lead for much of the bout. With one minute remaining the pressure was on with Macaulay still occupying the top spot. The 6-time reigning WSL Champion kept her composure and found a wave in the dying seconds, using her skill and experience to claim a come-from-behind victory and avoid early elimination. Courtney Conlogue (USA) took on Sage Erickson (USA) in the day’s opening heat and, with everything on the line in elimination Round 2, both surfers looked hungry for a win. Conlogue used her power game to post a solid 7-point score and take the lead. She backed it up it with a 5.77 for the heat win. Erickson wasn’t able to come back and leaves the competition in equal 13th place. Tyler Wright (AUS) kept busy in her Round 2 heat against Alessa Quizon (HAW), with 13 waves to Quizon’s 6, and her hard worked paid off. Last year’s world title runner-up sealed her place in Round 3 with a last-minute 8.10, eliminating Quizon from the competition in equal 13th place. Caption: Reigning WSL Champion Gabriel Medina (BRA) netted the day's highest two-wave heat total, an 18.30, in his Round 1 heat against Wiggolly Dantas (BRA) and Dane Reynolds (USA). Freddy Patacchia Jr. (USA) dominated his Round 1 heat against 11-time World ChampionKelly Slater (USA) and C.J. Hobgood (USA). Patacchia’s power surfing netted him two solid scores and a 15.66 heat total (out of a possible 20) with just 10 minutes gone. He went on to solidify his lead with another 8-point ride, leaving both Slater and Hobgood searching for two good scores. Slater made a final attempt with one minute remaining, but it wasn’t enough, and he will join Hobgood in elimination Round 2. Patacchia and Payne lead a strong Day 1 for the Hawaiians with other Round 1 wins posted bySebastian Zietz (HAW) and John John Florence (HAW). Silvana Lima (BRA) marked her return to the CT with an outstanding performing in Round 1. An in-form Lima posted two excellent scores, an 8.83 and a near-perfect 9.33 (the highest single-wave score of the Roxy Pro so far), to win the heat, upsetting reigning WSL ChampionStephanie Gilmore (AUS) in the process. Trials winner Bronte Macaulay (AUS) will join Gilmore in elimination Round 2. 2015 WSL Championship Tour Kicks Off Saturday! After a heroic Hawaii performance, Dusty Payne is back on the World Championship Tour! With a fresh and positive outlook for the new season, Dusty is fired up and looking to solidify his presence as a contender for the 2015 World Title. The first event of the year kicks off this weekend on the Gold Coast of Australia. Also joining Dusty at Snapper is Volcom Ambassador and 11-time World Champion, Kelly Slater. Kelly is looking to start his season off with his 55th career CT win and make a push towards that 12th World Title he has been searching for.Watch the live webcast on WSL's Website to see Dusty and Kelly battling it out with the rest of the contestants in round 1 of the season opener! Be sure to check out Dusty and Kelly in Volcom’s True To This: Chapter 4 "Growling on the North Shore". Olympic Council of Malaysia updated their cover photo. My niece is of Sicilian parents she is being nominated in the skysports sportswoman of the month her name:- Claudia Fragapane The 16-year-old gymnast from Bristol became the most successful English female competitor in a single Commonwealth Games in 84 years after winning four medals in Glasgow. The 4ft 6in teenager claimed gold medals in the individual floor and the individual all-round, as well as the team all-round event and the vault at the Hydro. Fragapane only made her debut as a senior gymnast at national level late last year at the Massilia Masters where she finished sixth – the highest of any British gymnast at the event. If you all can support and vote for her (Proud Uncle). http://www1.skysports.com/watch/tv-shows/sportswomen Watch her on YouTube and see how she lights up the room. Voting ends Monday morning UK time 8th September please help her get to the top spot as she deserves to be. The best of luck goes to our outstanding athletes taking part in the special Olympics in Antwerp Belgium. Photo - Cycling: 4 Scots selected in the long list for UCI Road World Championships! Jeux du Commonwealth Games Canada shared Pacific Institute for Sport Excellence's album: 20th Anniversary of Victoria '94 celebration. Kiwi shot putter Valerie Adams chalked up her 56th consecutive victory at the Van Damme meeting in Brussels. The 2014 Mountain Bike and Trials World Championships are scheduled to be staged in Hafjell, Norway, between the dates of 2 Sep and 7 Sep. UCI Travel will have a great choice of tours and packages. Photo - Athletics: BBC3, you'll be daft to miss it! Jeux du Commonwealth Games Canada shared The Commonwealth's photo. Ġest mill-isbaħ minn Villareal li f'logħba għall-karita' kontra Celtic lagħbu lil tfajjel ta' 13-il sena, Gohan, li jsofri minn kanċer aggressiv. Wara li lin-nurse qalilha li din kienet ix-xewqa tiegħu, Villareal tawh il-flokk numru 12 u qalulu biex ikun hu li jiftaħ din il-logħba. Wara li skurja, sħabu tat-tim għollewh fuq spallithom. Il-flus miġbura se jmorru għal riċerka dwar il-kanċer. Photo - Athletics: Moments later, Lynsey Sharp took Silver at the European Champs. A message from the Young Ambassadors of the Youth Olympic Games 2014! Trinidad and Tobago Olympic Committee added 8 photos. British Swimming shared a photo. Photo - Triathlon: Marc Austin finishes the season strong with a Silver in the U23 World Champs! 1ST NATIONAL YOUTH GAMES FROM 17TH TO 19TH SEPTEMBER 2014 http://www.foxsportspulse.com/assoc_page. Photo - .......Heirs to the Throne! Maltese Olympic Committee added a new photo. Video - CGF President HRH Prince Tunku Imran takes the ALS #IceBucketChallenge! Jeux du Commonwealth Games Canada shared Canadian Cyclist's photo. Trinidad and Tobago Olympic Committee updated their cover photo. UPDATE: SASCOC convey their heartfelt condolences on the passing away of Mr Qunta, a former employee at SRSA, who was passionate about development of sport at grassroots levels. We mourn with the family at this difficult time. May his soul rest in peace! Nick Butler: What does future hold for the Youth Olympic Games?